A couple of us are trying to get a community tag going at Office 2.0. Hopefully, everyone blogging at the conference will start tagging with o2con07 (letter “o” at the beginng and number “0” at the end). You can subscribe to the Technorate feed at http://feeds.technorati.com/search/o2con07. I’ll tell you what – for a freemium office suite, they sure throw a party together. I had great conversations with Ross from Nine Summer (he refreshingly gets the enterprisey, as he was CTO at Timex for 3 years), the folks from Spresent, and Tim from PlanHQ. I still think Ross and Tim need to connect to talk about PlanHQ. I then dropped by the House of Shields for RedMonk Evening Services, courtesy of Steve. This was a cool, small get together – focus on quality not quantity. I had some interesting conversations on the analyst biz with folks from Bite Communications. It’s refreshing to get to finally meet some people that you have been reading and blogging about for awhile, and hang out in a casual setting… and also pick up a few more subscriptions to follow. 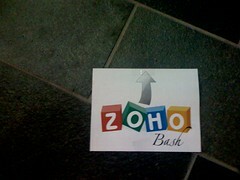 Thanks Zoho and RedMonk! I have to say that I’m so far impressed with how much enterprisey concerns are being discussed at the Office 2.0 conference. Adam Carson had a fantastic “What is Enterprise 2.0?” presentation that jettisoned the Enterprise track into gear today. Adam discussed many of the topics that I had on my list, and did a fantastic job setting the tone of what it takes to evangelize 2.0 initiatives inside a large company – a regulated company, at that. He talked about having Regulatory people involved early as a key success factor – I’m not sure how many of the vendors out here are thinking that way, but they need to. For my part (which you can see on the Office 2.0 video streaming page – click on the “On Demand Videos” tab, and then scroll to “The Web Practitioner”), I tried to talk more specifically about how to blend in collaborative interaction with compliance. Oftentimes the reason IT gets a bad rap is because that’s where compliance gets inserted. Like one of my fellow panelists commented – those are not the fun features (they just need to be there to be an enterprisey play). 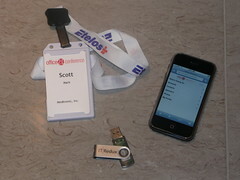 The technology happening at the conference is amazing. A see of 24″ iMacs for demo pods and 40 wifi hotspots with 7MB download – w00t! The iPhone has an iPhone-targeted web site to look up the agenda, browse attendees, and figure out where the free drinks are. The iPhone thing seems like a lot of hype, but it’s actually amazing to have everyone on the same platform. I have used it several times already to connect with colleagues. The USB drive has a Premium Edition of the ThinkFree suite on it. All of the presentations are being streamed live, so if you have nothing else to do today at 3:30pm US Pacific time, then check out my panel discussion live! Went to a couple more sessions in the afternoon at the Office 2.0 unconference. The first was tackling issues around getting 2.0 solutions inside the enterprise – challenges and opportunities. There were interesting angles on this question and the discussion ambled in true unconference style. Some good points around having an approach for seamless transition to ease end-user adoption. The basic approach that many 2.0 companies seem to be taking is betting on the freemium model and momentum from consumer use on personal time to generate leads, and then bet on rogue uses within a company leading to larger-scale adoption. I still feel like there is not a good enough story around many of these solutions to woo us enterprisey folk. The IT-created barriers that everyone likes to complain about in some cases are cruft but are often driven by compliance concerns and larger architectural forces such as validation, quality systems, and traceability. Hitting it big on Facebook is a bit different that hitting it big inside the walls. Having said that, I think I missed a good session by Ross Mayfield of Socialtext in the morning on Catalytics (check out his slides) – how to introduce change into an organization. I had a great side conversation with Ross… he has the vibe of a visionary and a good sell story behind his company, but he seems to get some of the key enterprise issues. Plus he was wearing a cool shirt! I also had a great side conversation with Kevin Warnock from gOffice. Keep an eye out for Kevin, as he has some fabulous ideas for building a community and content marketplace around his core offering, which is extremely high fidelity online word processing. Maybe a RedMonk briefing is in order? 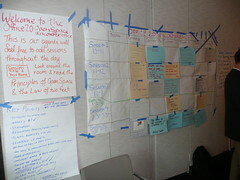 The agenda for the Enterprise 2.0 track at Office 2.0 is shaping up, and looks to be very interesting. As I mentioned, I will be on one of the customer panels along with Miko Coffey, Doug Marshall, and Lee White (check out Lee’s Social Media presentation) discussing “The End User as Web Practioner”. 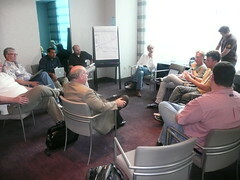 The Knowledge Worker 2.0 session looks good, as well as a session on Mindmapping. I’m also interested in Shel’s discussion on SAP Global Social Media Research– a strategic imperative at SAP… wow. In comments around the Office 2.0 site, I have seen that compliance is an issue on people’s minds with 2.0 technology. This is a topic of great interest to me, working in a regulated industry. We have to be very keen on compliance, and have dealt with this issue on collaborative technology, so I’m hoping to share my thoughts and learn from others in this area.